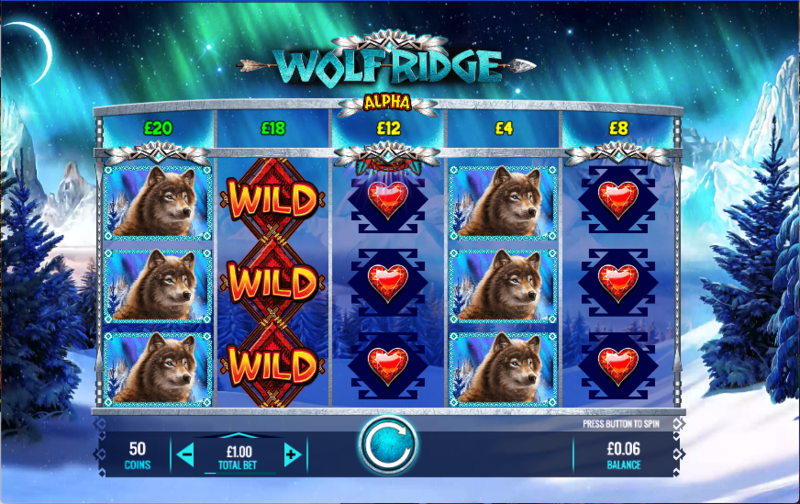 The Aurora Borealis, snow covered ground and lofty mountain peaks mean we are way up in the north of some unspecified country to check out Wolf Ridge, this online slot from IGT which comes with a clever way of triggering the bonus features. Wolf Ridge is a five reel slot with three rows and thirty fixed paylines; snow gently falls in the background to enhance the effect of the Northern Lights glowing in the clear, night sky. The four higher value symbols are the wolf, the raccoon, the big cat and the antelope; the lower values are playing card symbols in red, orange, dark blue and green and finally there’s a light blue gem. The wild is an orange ‘Wild’ which appears only on reels two, three and four and which will substitute for all others to help form winning combos except for the bonus wolf icon. The Prize Disk is the row above the reels with the various prize amounts and other features displayed; on each spin it will move one place to the left. When a bonus wolf lands on reels one, three or five it will award the prize shown above that reel – if it lands on reel three and a cash prize is won it will be multiplied by 3x. Ten free spins are awarded when the bonus wolf lands beneath ‘Free Spins’ on the Prize Disk; during the spins the Prize Disk appears on all reels and each one landing below ‘Extra Spins’ will award two more spins, up to a maximum of two hundred and fifty. 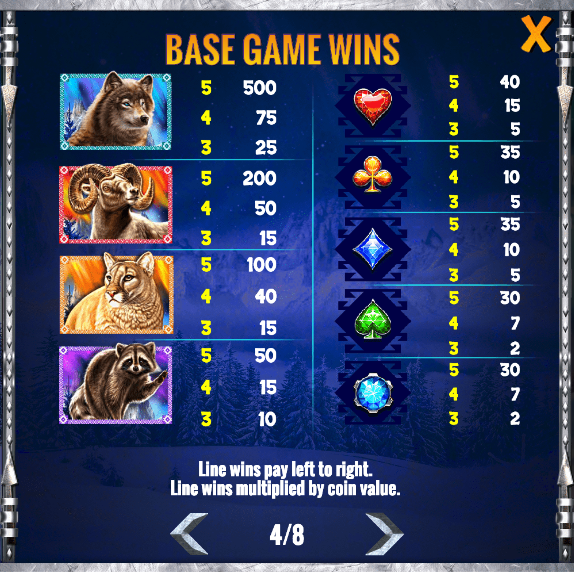 Prizes for winning combos of high value symbols are worth twice as much as in the base game. We always appreciate some creativity in a slot machine and the Prize Disk offers just that with its clever way of triggering the features or winning a bit of cash; it’s all enhanced by the wintry atmosphere and drumming soundtrack.